Creation of reference is an integral part of scientific work. In order to simplify this work Publication Reference Generator was created. The given service was developed for the automatic generation of references. After а user enters the service page, (s)he needs to specify the reference format, source type (a book, a magazine article, a conference, a web-site) and the publication language (Belarusian, Russian or English) (figures 1, 2). At the next step the user inputs data (figures 3, 4). The mandatory form fields are indicated by asterix (*). There is also a capability to see the examples of filling, so it is necessary to click the button “Erase All Data Rendered In the Fields Below and Show Our Examples” (figure 3). 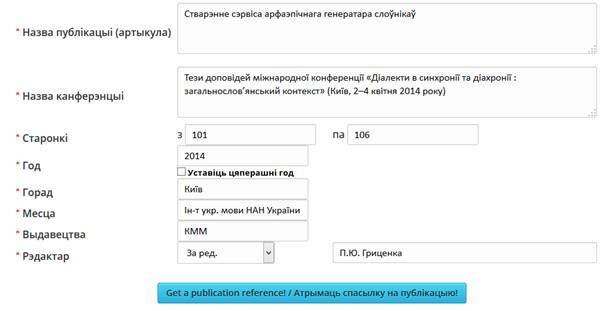 After filling in the form it is necessary to click the button “Get a publication reference!”. The result will be displayed on a single field below (figure 5). At the moment only the format of High Certifying Commission of Belarus is available for users. It is planned to increase the number of reference types and add the following formats: Chicago, MLA, APA. Working with the reference generator in further detail allows to learn about their content level and structure, and this is the right framework for developing reference recognition system in Belarusian and Russian texts. The information, which one can get from references during the recognition, may be useful for libraries, publishing houses or research institution, as it carries information about authors and editors, publication titles, publisher’s imprint and so on. The similar services for the automatic reference generation (Citation Machine): Son of Citation Machine, bibme, MakeCitation.